There's reason why ordering in food is one of the fastest growing trends in urban India. Because firstly, it's food. And then, it's being delivered right to your doorstep. What's not to love, really? 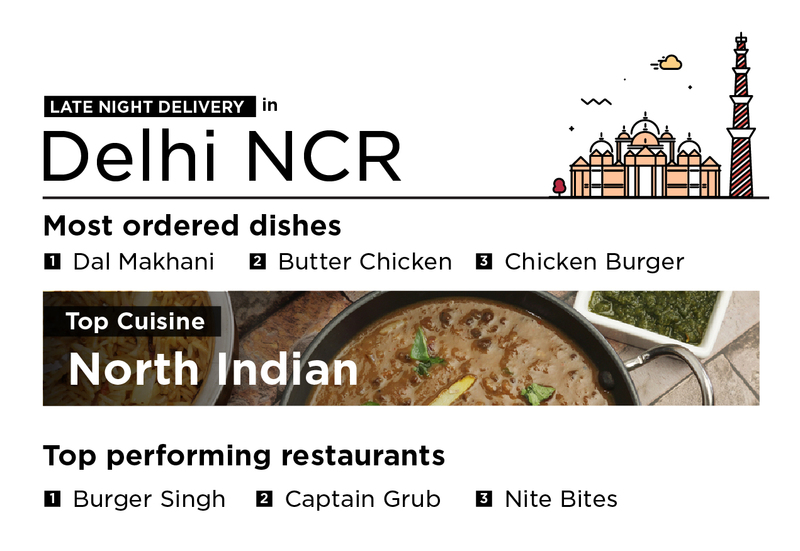 And now with night deliveries, online food ordering is reaching new heights. Well, gone are the times when you had to sleep hungry just because it's too late to go out and there was nothing in the kitchen except ketchup. Thanks to apps like Zomato, late night food delivery has become as natural as daydreaming during a lengthy meeting. In fact, we have noted that the late night delivery component of Zomato's online ordering business has been growing steadily in 2016. It contributed 6% of the total order volume in December 2015. As of May this year, that figure rose to 9%. 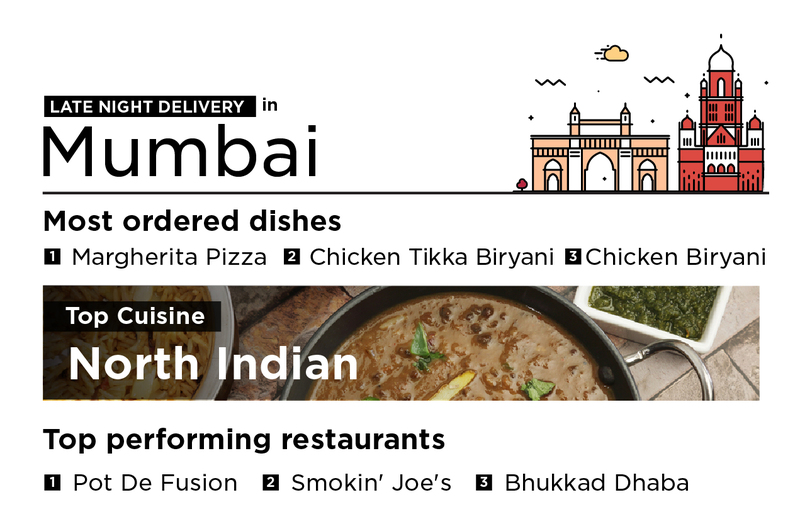 This is impressive when you consider that of the 10 Indian cities that the Online Ordering on Zomato is live, only 7 cities currently have late night deliveries. We also found out that Saturday nights have the highest volume of late night orders..err...for obvious reasons. We dug a little deeper to figure out exactly how urban India likes to order in, when the clock is closer to midnight. And we found, most cities love to order Biryani! While North Indian cuisine rules supreme in well, north India (surprise, surprise), Delhiites also love their burgers. Dal Makhani, Butter Chicken, Chicken Burger, Paneer Butter Masala and Chicken Biryani rounded off the top-5 most ordered dishes in the NCR. The island city appears to be big on pizza. Moreover, Margherita Pizza is the most ordered late night delivery item on Zomato. While Chicken Tikka Biryani and Chicken Biryani round off the top-3 list, Chocolate Mousse is undoubtedly the city's favourite midnight dessert. After Pizza and North Indian food, Chinese turns out to be the most popular cuisine. And Pepsi (600ml) is the preferred soft drink. 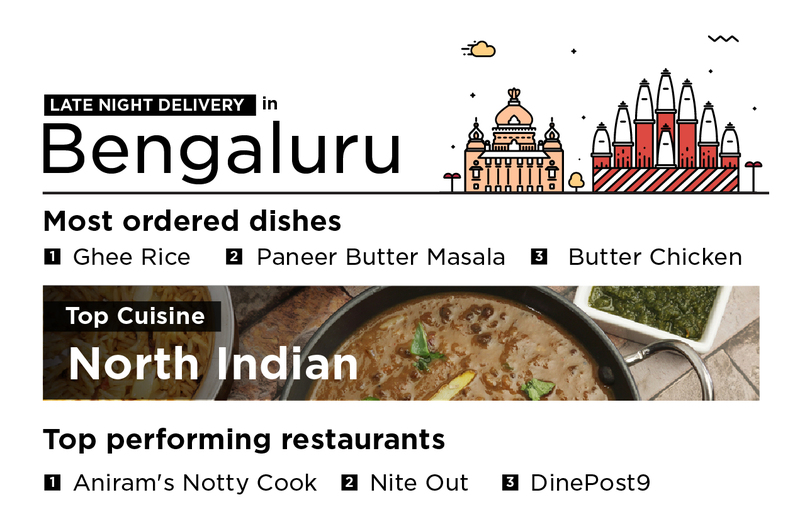 In Bangalore, Ghee rice topped the list of the late night delivery food items, but that's where the South Indian fare ends. The items on the top-5 list were as follows: Paneer Butter Masala, Butter Chicken, Dal Tadka and Chicken Noodles. It's fair to conclude that North Indian cuisine dominates the late night scenario, closely followed by Chinese food and burgers in Namma Bangalore. 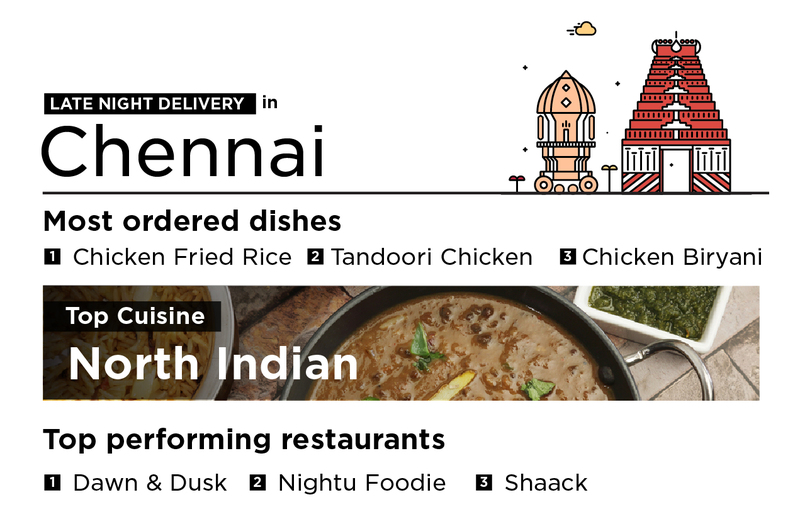 Believe it or not, Chicken Fried Rice tops the list of the most ordered late night delivery dishes in Chennai. It's closely followed by Tandoori Chicken and Chicken Biryani. Pepsi (500ml) is often ordered along with the main course. In terms of the cuisines, North Indian is followed by Continental and Chinese respectively. Metropolitan indeed! 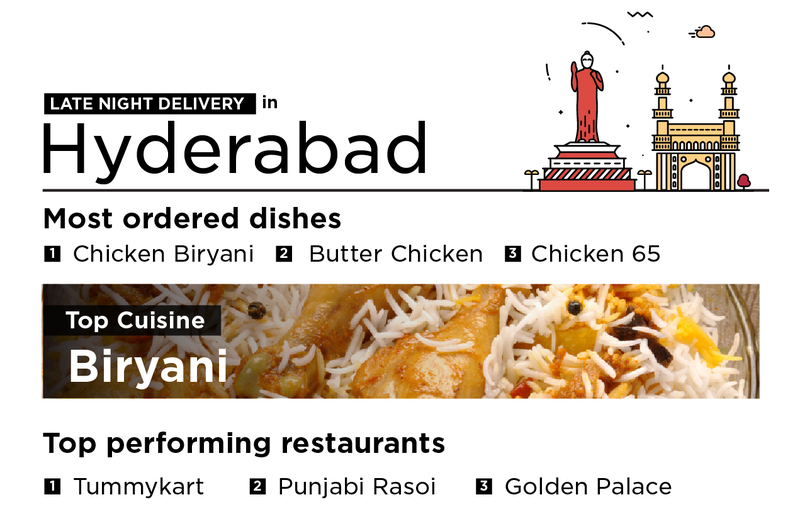 No surprises in Hyderabad as Biryani leads the way in this sweltering city. Seemingly as an antidote to the hot weather, buttermilk is heavily ordered during this timeframe. Butter Chicken and Chicken 65 complete the top-3 list. Pune might be Mumbai's cousin but the urban food trends are distinctly different. 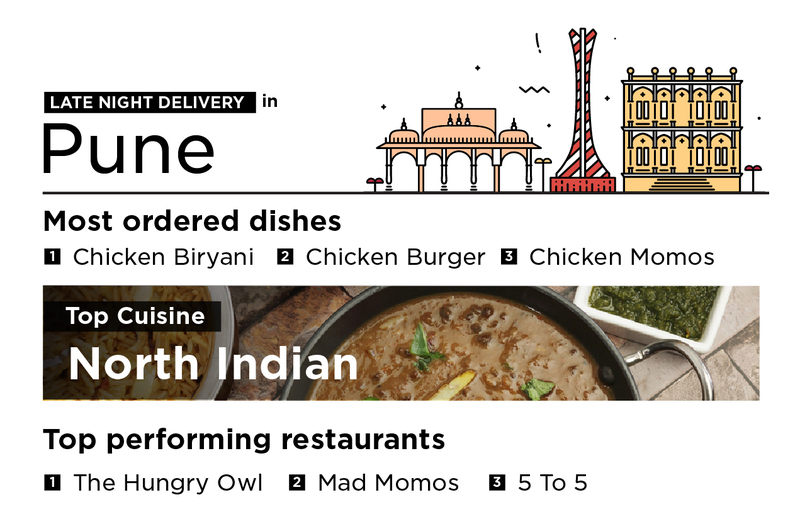 Pune is prone to ordering Chicken Biryani, Jumbo Chicken Burger and Chicken momos. Pizza doesn't even feature in the top-10 list! Among the cuisines ordered at night, North Indian is at the top of the chart followed by fast food and continental. Kolkata appears to have a soft corner for Chinese cuisine as Hakka Noodles and Fried Rice are among the most ordered food items. They are closely followed by Pepperoni Pizza. Along with Chinese, Italian and North Indian cuisines are also preferred when the watch is quietly crossing from the pm to the am. These city-wise trends have an impact on the growth story as well. 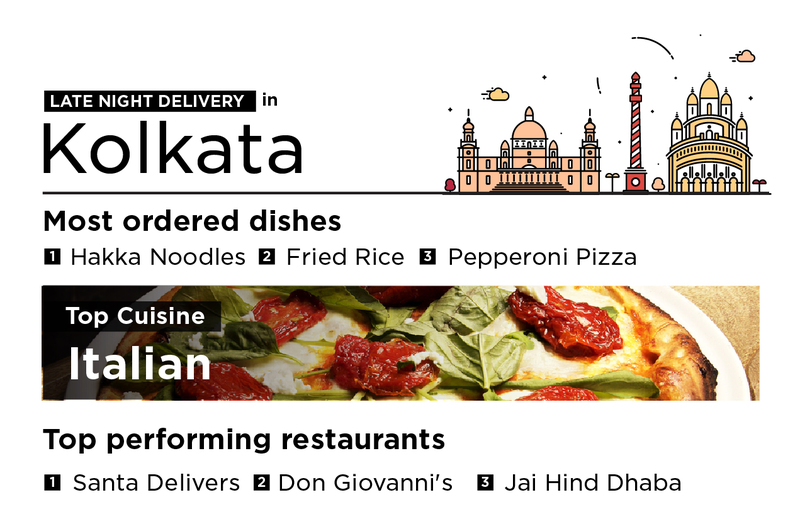 After all, the late night delivery segment of Zomato is growing at around 25% more than the overall Online Ordering business.